Moving on to the kitchen. This was one of the rooms we tackled when my mom was here. I say “tackled” because I simply felt too overwhelmed to have at it by myself. I was troubled by the color of the cabinetry vs. the color of the woodwork and there didn’t seem to be a paint color that would satisfy my desire to blennnnd the two. Plus, I was just flat worn out. Until G.G. arrived. Here is the only ‘before’ picture I have. Obviously, I did not take it, it was taken well before we moved in. For this post, though, this one will have to suffice. When the time came for my mom and I to get going on this mini-project we simply couldn’t hold back the tide. Note the contrasting wallpaper choices. The upper wall was covered with a dainty floral on an ivory background. The wall below the chair rail was papered in a deep maroon. I say maroon instead of ‘cranberry’ or ‘pepper berry’ because it looked, well, maroon. Ick. The crowning glory was the ever-popular circa 1989 cornucopia swaggy border. Apples, anyone? We started by pulling all that down. And then repainting the room a color called “wicker”. You guessed it, from Lowe’s. Then we changed out the light fixture over the table. And changed out the handles on the cabinetry to a much more neutral matte black, replacing some old-world style brass colonial lovelies. And replaced the punched tin accessories. I like it. It’s simple, soothing and because the kitchen is a bit on the small side, the light neutral color helps to make it feel less crowded. Less chaotic. Wait. Can a wall color do that? Of course, if I had my druthers (and an endless bank account) I’d change out the countertops with something solid-surface and the appliances with all stainless. The refrigerator that came with the house is shorter than I am and has no ice maker, much less a water dispenser. But we’re making do, happily. The kids actually think emptying ice cube trays is fun. It looks great. I must ask how do you all eat at once with only 6 chairs. By the way I love the chairs. Your kitchen looks fantastic! GREAT, and much needed changes, for sure. Please report back to us when emptying the ice trays suddenly goes from fun, to a dreaded, whine-filled chore. 🙂 Oh, it will happen. I have so enjoyed your before and after pictures… this is as good as a HGTV show..
Looks great! Paint color really IS magical, isn't it? I could swear you even re-finished the cabinets! So restful and open and fresh. I love it. I love the color names too. Looks great!! Don't yah just love midwest "small room" homes. LOL I am a midwesterner but am loving my southern open home right now…. You've got an eye, girl! Looks fab!! Yes, the right color can do WONDERS!!! Beautiful!! I cannot BELIEVE how BUSY you've been!!!! SO much better! The cabinets look new. Amazing what paint and a little hardware can do. Its amazing how taking down that border really opens up the place…paint makes it pop! Great job! When we built our house, I loved picking out the cabinet hardware. It can totally change the look of a room. Good job! 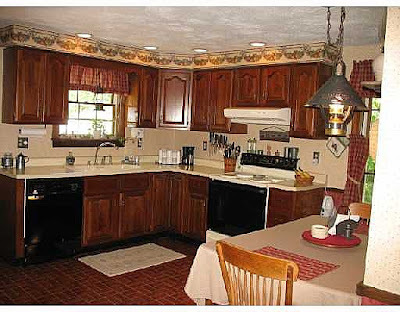 YOu know I love a great kitchen transformation…great job girl! Looks great! You're getting so much done. Don't know how you do it all. We have the same Pottery Barn table, too, except ours in actually in the dining room. You are giving me inspiration as we have a whole house full of projects to get done! Making do happily…that makes my day! I love "making do"! What else IS there to do really? Making do happily. I think it's going to be my new motto! Ah that is why your kids are SOOO wonderful! I was too wonderging if you eat in shits? Nice catch… And thanks for the laugh! And Chelley is making me laugh! And I'm sure Miss Vivi will find "her" perfect spot at that fabulous table!! This is a great re-do! I don't know if you like blue or not…but this is a beautiful earthy blue color…really pretty! Sometimes making do is fun.